Ce document au format PDF 1.3 a été généré par calibre 1.6.0 [http://calibre-ebook.com], et a été envoyé sur fichier-pdf.fr le 31/03/2016 à 18:37, depuis l'adresse IP 176.152.x.x. La présente page de téléchargement du fichier a été vue 187 fois. Taille du document: 29.6 Mo (201 pages). greater acts of heroism in the name of the honoured fallen. Ecclesiarchy ensures that they are equipped with the best wargear the Imperium has to offer. of Battle will be found fighting with faith and steel. Militant divide their time between rigorous training and devout worship of the Emperor. them in the fight against their enemies. one of the Imperial organisations. Most of the Progena will end up in the Adeptus Terra as scribes, clerks or overseers. those who do are well aware of their privilege. 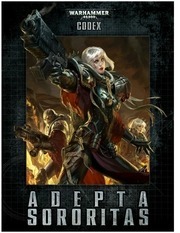 The Adepta Sororitas were founded during the turbulent times known as the Age of Apostasy. the Horus Heresy – the Reign of Blood. Vandire’s personal bodyguards, protecting him from assassination by his enemies. from the traitor’s shoulders. The Reign of Blood was over. true defenders of the faith and a very physical reminder of the power of the Ecclesiarchy. purpose that the Imperium had not witnessed since the legendary days of the Great Crusade. stood as faithful and loyal defenders of the Ecclesiarchy, and the Imperium. renowned for their heroic acts of self-sacrifice, echoing the selfless nature of Silvana. Militant spread, establishing subsidiary convents on key worlds across the Imperium. own lifetimes, performed legendary acts and led their Orders in countless, bloody victories. martyred at the hands of Chaos worshippers and barbaric aliens. own traditions, doctrines, livery and titles. unknown for a Preceptory to adopt subtle variations of their Order’s livery or traditions. fortress-cathedral in the Imperium, as well as the priceless sacred relics housed within them. might, slaying the Emperor’s enemies without mercy or compassion. and to remind the Imperium’s populace of their duties to the Adeptus Ministorum. and permanently removing them from power. brought before the Golden Throne. righteousness a weapon as potent as bolter fire. the founding of the Adepta Sororitas, and by this time, its patron saint, Mina, was long dead. accordingly a blood red rose, prominent with thorns, placed upon a pair of crossed swords. are renowned for the ferocity of their assaults. bolters calmly levelled where lesser warriors would panic and falter. by extension, that of the Emperor. of the countless battles fought during this blood-soaked time. to purge the heretical warrior-cults of the Peleregon cluster. through the edritch storm, slaying the Eldar Farseer with a single bolt round to the head. Fortress-sanctuary 101 and all the Sisters of Battle within are destroyed by the Necrons. Engines rampage across the battlefield, staining it with Ork blood. no sign, for she has vanished as mysteriously as she appeared. evacuate the Ecclesiarchy’s priests from Okassis. defenders as Ghazghkull Thraka invades the world of Armageddon once more. refers back to these entries. section of the Warhammer 40,000 rulebook. to perform the seemingly impossible upon the battlefield. rules it bestows when used, but all Acts of Faith use the rules listed here. with which phase(s) the Act of Faith can be attempted in. or War Hymns special rules. rule until the end of that Assault phase. off the most severe of wounds and resist the witchcraft of enemy sorcerers. special rule automatically pass all Leadership tests until the end of your next turn. Warlord Traits tables in the Warhammer 40,000 rulebook, or roll on the table below. the Ecclesiarchy’s enemies and slaying them without mercy. The Warlord has the Fear special rule. refuse to yield before the Emperor’s enemies. have a 5+ invulnerable save. The Warlord’s unit re-rolls unsuccessful Deny the Witch rolls. rage that they call upon to smite their foes on the battlefield. The Warlord has the Rage special rule. military leader who inspires intense devotion in their warriors. when taking Act of Faith or War Hymns Leadership tests, unless their own is higher. All friendly models within 12&quot; of the Warlord have the Stubborn special rule. foes of the Imperium across the galaxy. leading them from the fore whilst reciting the great hymns of the Ecclesiarchy. with a speed and hatred born of holy fervour. models in the Canoness’ unit gain the Hatred special rule until the end of the current phase. WARGEAR: Power armour, bolt pistol, chainsword, frag grenades, krak grenades. during the course of a campaign. the fray despite grievous injuries. UNIT TYPE: Infantry. Dialogus and Hospitaller are Infantry (Character). SPECIAL RULES: Act of Faith, Shield of Faith, Stubborn. fresh strength in the righteous work to come. special rules until the end of the current phase. grenades, chirurgeon’s tools (Hospitaller only), laud hailer (Dialogus only). with which to smite the Emperor’s foes. over the roar of guns and chainblades. to present a very obvious, and often lethal, reminder of the Ministorum’s true power. 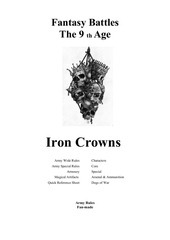 SPECIAL RULES: Independent Character, War Hymns, Zealot. the following war hymns to immediately take effect. the faithful feel the blessing of the God-Emperor upon them. Belligerent, the Priest calls upon the Emperor to help him smite his foes. The Ministorum Priest has the Smash special rule until the end of the phase. faces of the foe, exhorting his followers to excel in the Emperor’s sight. The Ministorum Priest and his unit re-roll failed rolls To Wound until the end of the phase. Passive, if not its letter. mysterious order of the Ecclesiarchy famed for its unflagging devotion to the Emperor. offer up those they slay to the Emperor – a payment of the blood-debt Mankind owes him. Death Cult Assassins have perfected the art of blades, which when combined with their deeprooted devotion to the Emperor and the Ecclesiarchy, makes them lethal and loyal followers. SPECIAL RULES: Feel No Pain (Arco-flagellants only). Crusader: Flak armour, power sword, storm shield. Death Cult Assassin: Flak armour, two power swords. skulls of alien savages in a single blow and smite hideous Daemons back into the Warp. UNIT TYPE: Infantry. Celestian Superior is Infantry (Character). SPECIAL RULES: Act of Faith, Shield of Faith. the Celestians’ unit gain the Furious Charge special rule until the end of the current phase. WARGEAR: Power armour, bolt pistol, boltgun, frag grenades, krak grenades. with great esteem by the Sisterhood. path of a Sister Repentia occupy a state of grace that many aspire to, yet few ever attain. the absolution denied to them in life. UNIT TYPE: Infantry. Mistress of Repentance is Infantry (Character). SPECIAL RULES: Act of Faith, Fearless, Fleet, Rage, Shield of Faith. wounds until their foes have been slain. 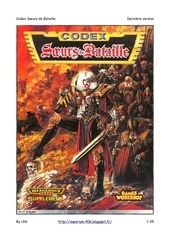 interpreted by the Ecclesiarchy, with precise volleys of bolter fire. UNIT TYPE: Infantry. Sister Superior and Veteran Sister Superior are Infantry (Character). driven to unprecedented feats of prowess. special rule until the end of the current phase. the Orders Militant maintain several units who are almost solely comprised of such warriors. melta beams and searing flames. Dominions embark on their transports once more, eager to engage their next target. Ce fichier a été mis en ligne par un utilisateur du site. Identifiant unique du document: 00413359.